"Gene Autry on Melody Ranch"
Gene Autry, America's Yodeling Cowboy, was "back in the saddle again" for 16 years on radio, sponsored by Wrigley's Doublemint Gum. His background as a singing cowboy in the Republic westerns of the 1930s made him a singing cowboy movie star with fans of all ages, and his 1932 hit "That Silver-Haired Daddy of Mine", his first gold record, established his reputation as a recording artist. He got on radio via a Chicago radio station with a show sponsored by Sears, and then went to the very popular The National Barn Dance. Sears catalogs kept featuring his records, so his fame grew as a singing star throughout the 1930s. 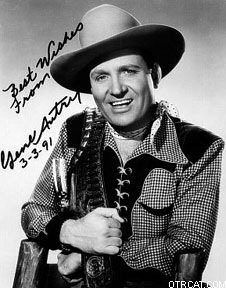 By 1940 Gene Autry was one of the four most popular movie stars in America, a major network radio star, and a top-selling recording artist and proud to have be on the air doing "Gene Autry's Melody Ranch," a radio version of his pictures. That is, a few songs, some rip-snortin' action that was like a mini-Republic movie within the show, and some knee-slappin' humor with the boys, especially his sidekick Pat Buttram. Johnny Bond was Gene's singing duo "pardner" and did the comedy, too. Carl Cotner was the steel guitar slinger extraordinarily. There were many featured singing groups through the years, including the King Sisters, the sister act that is associated with Alvino Rey, who married Louise King. Gene went on to do The Gene Autry Show on TV, and along the way had becoming a savvy investor and businessman. Gene had written many tunes, including "Here Comes Santa Claus," in 1949 but earlier in his career via his association with the Wrigley family of Doublemint and Chicago Cubs fame in Chicago, he had learned that owning a sports teams was a great investment. Gene went west again, to rope the ownership of Major League Baseball's California Angels, along with a number of radio and television stations. Autry's career included nearly a hundred movies, 16 years on radio, more than 600 records that sold millions (seven gold and two platinum), nearly a hundred TV shows, and more than thirty years of personal appearances across the country and overseas, Gene Autry was pushing 91 at the time of his death in 1998. He remains the only Western star on the top ten all-time box office moneymaker list. As the boys at the Melody Ranch might say, "That Yodeling Cowboy dun' real good!" For more Autrey performance, see also the Melody Ranch and Melody Roundup recordings. See also the adventures of Gene's horse: Adventures of Champion. 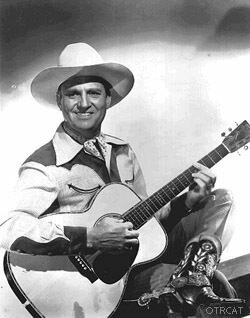 Be the first to comment on "Gene Autry"